Here is what i have so far. Im using as reference anatomy books as well as the ziva promo videos, freeze framing the videos to get a look at how they did it. So my quesiton is: what is considered best practices when it comes to some of these attatchment points? When would one use fixed vs sliding? 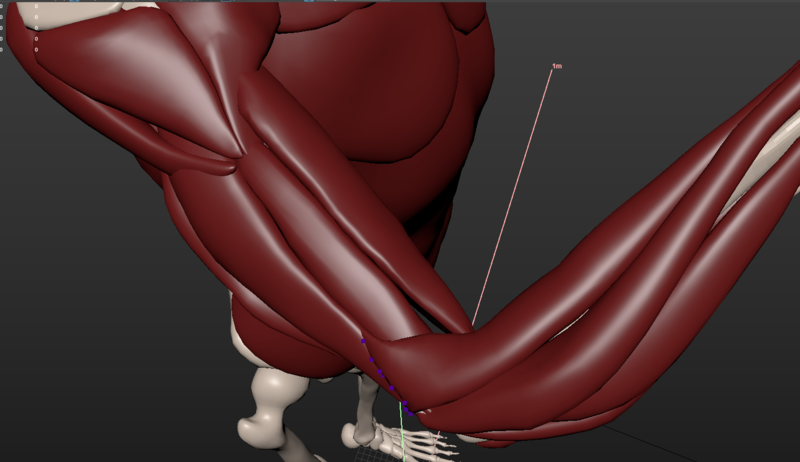 Will using sliding attachments in my biceps give me any issues on a more serious animation? 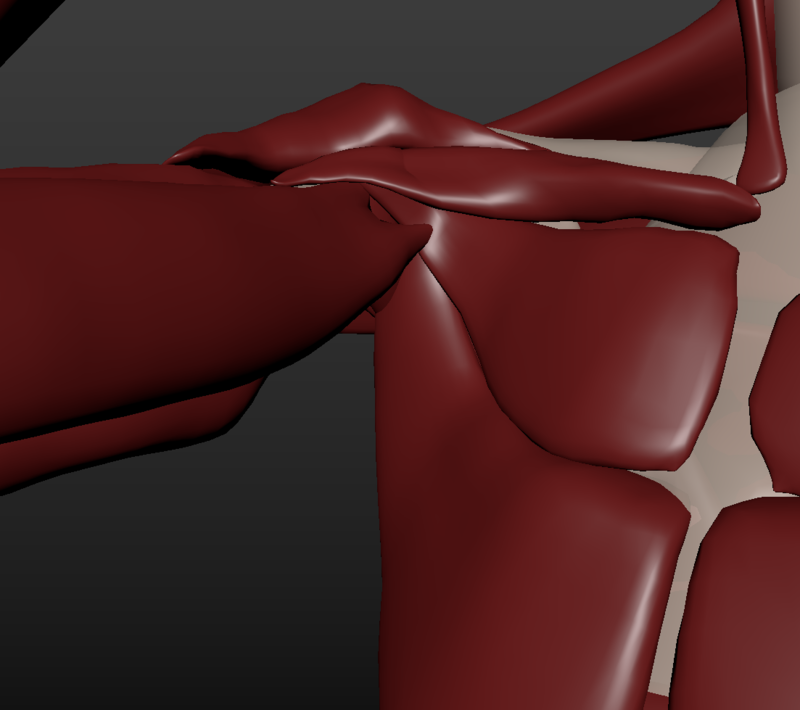 Having an issue in the shoulder area, where it becomes a bit of a mess. any tips on how to keep this area clean, not penetrating and deforming nicely? As for best practice with attachments. A good rule is to use small attachments at the origin / insertion points at the ends of your muscles. By small attachments I mean small groups of vertices. Do a broad strokes setup where you only do origin / insertions. Play back the scene with some basic animation on the character -- maybe he's going through some basic shoulder poses or something. From there you'll be able to see how your muscles are performing and gauge what you need to do from there. In general with attachments, you want to be as sparing as possible. 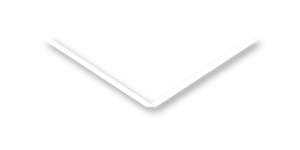 Using too many attachments will result in your system being over constrained and won't give you the nice organic results you want. 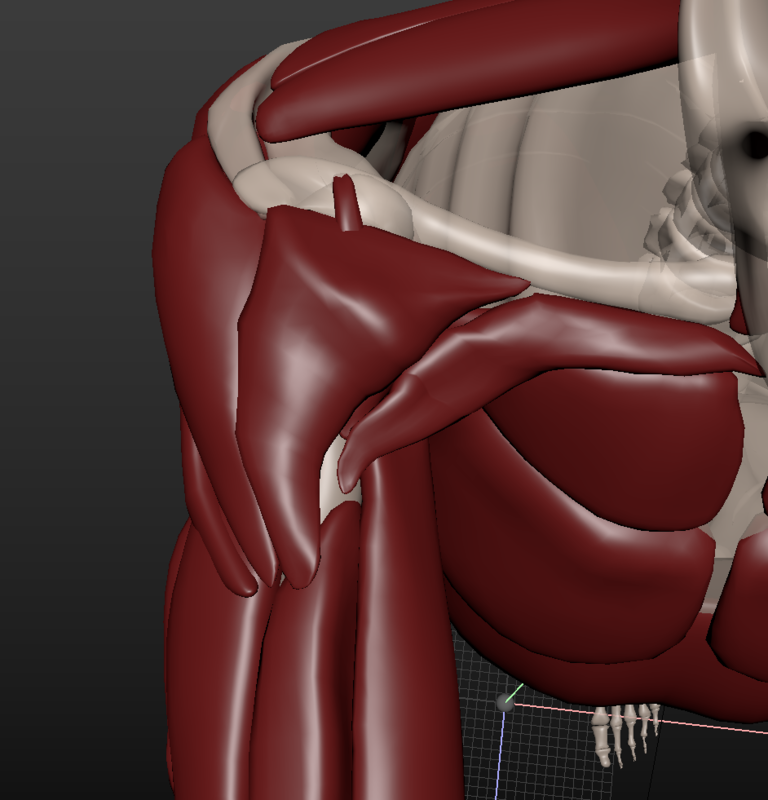 Use fixed attachments to attach muscles to bones at origin/insertions. Use sliding between muscles or between muscles and bone when you want to preserve the distance between bodies but allow them to slide tangentially. Any tips on the latisimus dorsi? 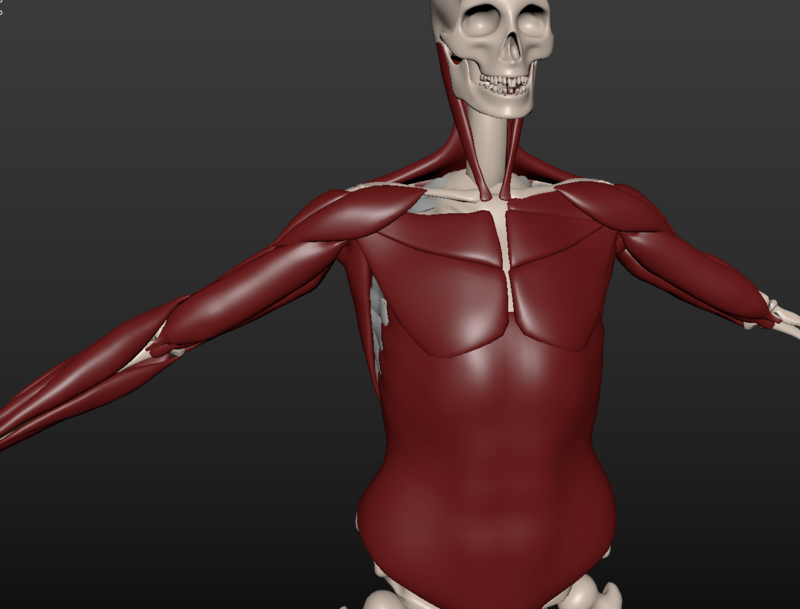 It wobbles around alot, should i attatch a large portion of the sheet muscle to the ribcage? Just looking at your skeleton there and noticed the hips and femur bones are bending. I know you're focusing on the upper body -- just wanted to check the bones in the upper body are moving as rigid objects, rather than bending. Could be wrong but it also looks like your scapulae aren't moving. As for the lats, try putting a zFiber on there. Paint the end points so that the insertion onto the humerus is black and the vertices that run along the spine are white (or vice versa). At the start of your animation, set two keys on the excitation attribute. 0.0 at the start frame and 5 frames later, key it to 0.3. You should see the lat contract over those frames and you'll have tension in the muscle over the course of your animation. The reason to key it, rather than just set it, is so that the muscle doesn't jump abruptly on the first frame. This will give the collisions a better chance to resolve. You can still use zLineOfAction to do additional contraction for different poses. Hey andy thanks for the advice, my reply is late but I went and addressed the issues you mentioned right away. I have yet to keyframe excitation yet, however i was thinking it would be cool if on the zLineofAction node could take care of preroll somehow. Also does anyone have any good tips for fixing penetrations as fast as possible? It would be great to have a tool that pushed verts apart in a way that maintains a smoothish shape. First thing I noticed was the sternomastoids on the neck are bending quite a bit. Those lines should be fairly straight through the different poses. 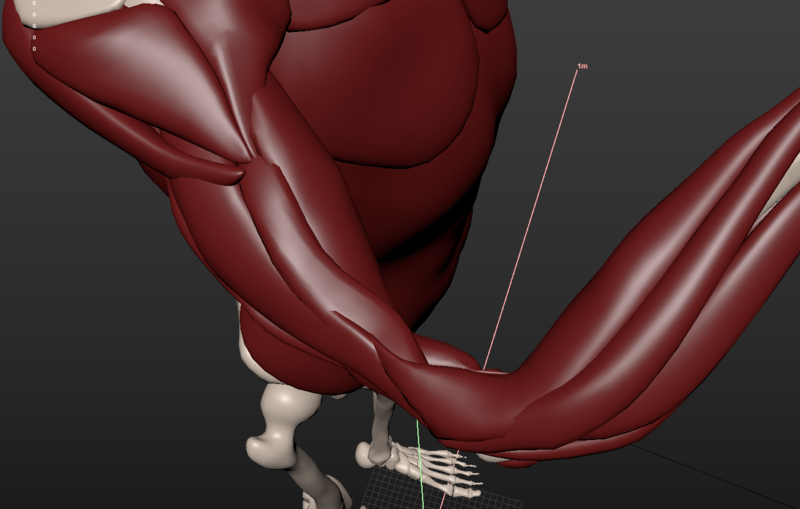 Looks like the tet resolution is a little low and/or you might have attached too far down the muscle to the bones. These muscles will also benefit from the constant excitation I mentioned earlier. 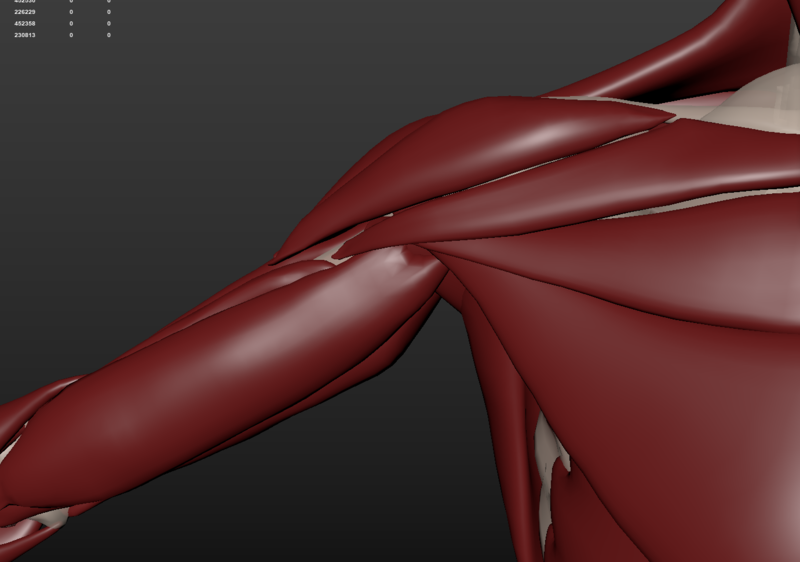 For your penetration issue, I haven't tried this exactly, but you could experiment with turning all the muscle geometry objects into tissues, with a fairly high tet resolution. Make the bone geometry into ziva bones. Turn damping on the solver up. Turn collisions on. The solver will try to resolve the collisions on the first frame of the simulation. With a higher damping value they might stay in pretty much the same place. Worth a shot? Can you explain how you'd want to see the line of action help with run up? How does it the sim look from the back? hey thanks andy, I misinterpreted stretch bias docmentation at the time of that video. Here is a more recent simulation with back and side view. Im still learning how the LOA works so i will hold off on recomending anything. Still getting some penetrations even on muscles that start without them. Can people share their production settings with me? I am currently using tet size of 1 and 2 solver samples. wip. ziva cloth definately solves much better for this stuff. Very impressive. Still lots of issues tho, I think my line of action pos sensitivity is too high. Those quads look like the should jiggle a bit more. They're pretty meaty, yet don't have a lot secondary. I agree about the pos sensitivity -- looks like the flexing hits quite suddenly. Pretty clean cloth sim though! 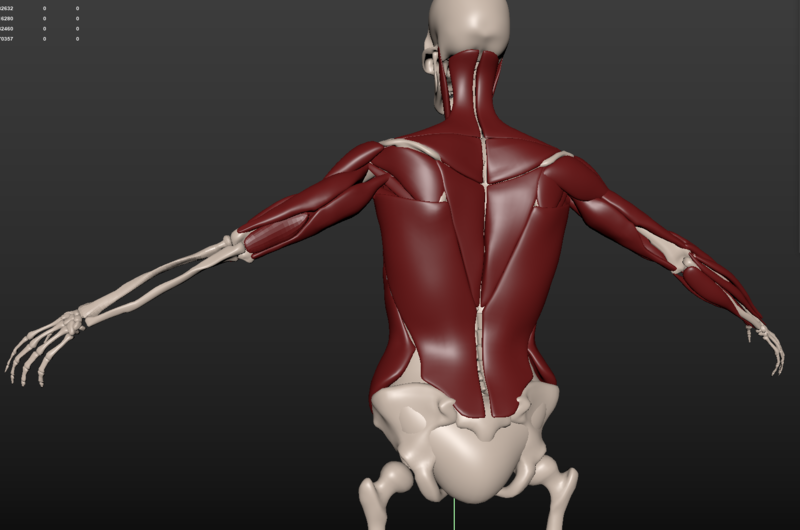 When people create the human form in zbrush they create it as it is, with gravity affecting all the soft tissues. You might say the gravity is "baked in" from a simulation perspective. However if you simply convert a fat layer to a ztissue and attatch it to a bone, gravity begins to take its toll... AGAIN. Its a doubling up of gravity. Is there a solution to this? My current Idea is to resculpt my body and remove all trace of gravity!! One strategy is to negate the effects of gravity in bind pose. What you could try, is taking your current setup and reversing gravity. (so multiply the value on the solver by -1) Then solve a few frames, let the sim settle, stop the solve, and duplicate off the geometry. Would be interesting to see how you go with this approach! Wondering what settings you have for your fat solve. I would suggest you run 4 substeps, and turn any damping right down so you can capture the full secondary motion from your animation. (1 substep for instance will have the effect of "damping" your results) The jiggle frequency for fat is pretty high; would be cool to see a little more in your sim. Some very cool stuff happening here though. Are you planning on running other animations? This is looking really good. I just saw the latest video with updated jiggle settings and it is coming together nicely. The only thing that was sticking out to me was the pelvic bone area was shearing. Even though your fascia is wrinkling/shearing oddly in some areas your outer skin is looking quite stable. Are you running a tissue sim after the the cloth sim? The subtle form changes in the upper back are quite convincing, and your process for sculpting the breast tissue without gravity turned out well. Andy Thanks so much for that info, I had it on 1 substep. Noob mistake. Here is a render after i made the change. Also I switched the fascia connection from fixed to sliding which is shown in the renders fat sim but incidently i didnt update the fascia for this particular render. do people usually use a skinwrap to drive the render geo from the fat mesh? Oh wow, way more motion! Nice! Would be cool to see your new fascia, and also what the sim looks like from the back. Then just wrap a copy of the render geo to the fat. Make a blendshape between that and the skincluster alembic and paint the weights of the blendshape to blend the two meshes together.